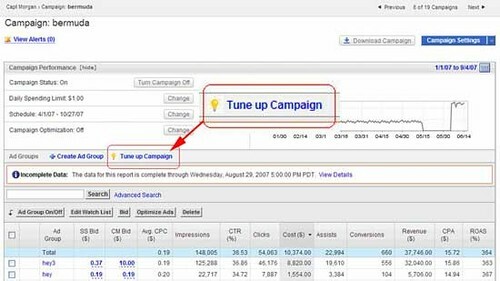 Yahoo Search Marketing has released a pretty cool feature that allows you to fine-tune your campaign and have greater control (and feedback) over your accounts. Additionally, you can now save your preferences so that when you log in, your previous view is restored. 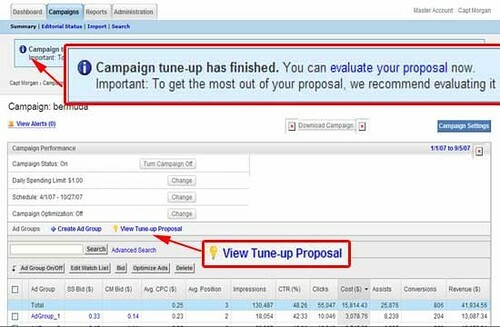 Here's an example of the Campaign Tune-Up feature. As you notice, there's a new tab to allow you to tune your campaign. Once Yahoo performs the tune-up, you can view your results. Previous story: Google AdSense's MediaBot Crawler Breaking URLs?